A moisture meter that can be kept easily in any work vehicle or even in your pocket, the MO 210 is as versatile as it is convenient. The MO 210 by Extech can be used in a variety of applications, well suited for any array of contractors – ranging from carpentry, masonry, insulation, and more. The MO 210 has an accuracy of plus or minus 1% in wood applications, and an accuracy of plus or minus .1% in other specified applicable building materials. Functioning on the principal of electrical resistance, the MO 210 is an excellent selection for many contractor applications. The MO 210 features an LCD screen display with both analog and bar graph readings, and electrode pins – which are a threaded measurement, and replaceable after expected use life. The housing on this moisture meter is impact resistant – standing up against the wear and tear that is typical of a work site. Power is conserved thanks to the automatic 15 minute auto shut off, and the CR-2032 batters are included. Replacement batteries can be easily purchased at any hardware or home retailer, and the MO 210 has a built in battery check and verification test. On the go measurements have never been simpler! This moisture meter has a cap to cover the pins, and the belt clip provides an alternative to pocket storage. On the job site, use the MO 210 to check moisture levels in wood, cardboard, plaster, mortar, sheet rock and wall board. Weighing in at just 3.5 OZ, you’ll barely notice the MO 210 in your pocket, but you definitely won’t want to forget it! 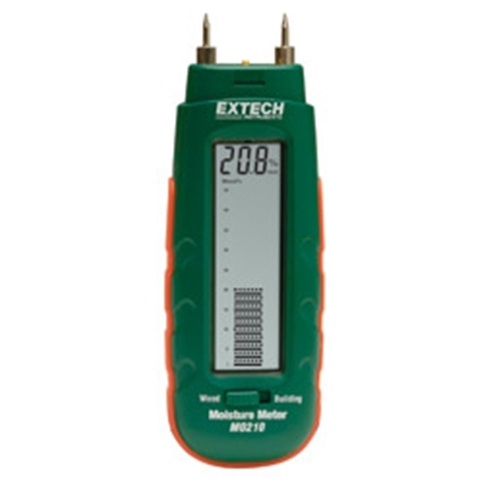 Order the MO 210, or browse additional moisture meter options by Extech at Intech Equipment and Supply online today!